In coming decades, emerging market (EM) economies will need substantial new capital to accompany and sustain their rapid growth. Investors in developed economies, meanwhile, will want to put their money where the growth prospects are brightest. The users and providers of this capital typically come together in the stock and bond markets, where a common vehicle for many retail investors seeking to invest in EMs are mutual funds and exchange-traded funds (ETFs). Indeed, such funds—particularly those domiciled in the United States and Europe—have increased their investments in EM economies since the 1990s. Lately, some economists and policymakers have suggested that emerging economies should be cautious about investments from these kinds of funds. For example, in chapter 2 of its most recent Global Financial Stability Report, the International Monetary Fund (IMF) discusses at length the influence of funds on financial markets in emerging economies, stating that “the increased foreign presence in local asset markets...may have made local asset prices more exposed to global factors,” and that “large foreign participation in local markets can introduce instability.” The report also argues that flows from funds are a relatively unstable source of capital. In light of these concerns, the IMF concludes that “close monitoring of cross-border activities of open-end mutual funds is warranted.” The World Bank has reported similar results and conclusions. A closer look at the data, however, suggests that funds should not be singled out for such scrutiny. In this blog post, we’ll examine just how large funds’ participation in EM financial markets is; a subsequent blog post will address the concern about the relative stability of fund flows to emerging economies. 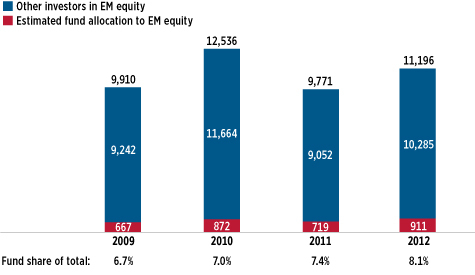 Funds’ participation in the stock and bond markets of EM countries has indeed increased markedly in recent years. Nevertheless, funds hold a relatively small amount of the total value of stock and bonds of EM countries, which suggests that any concerns about the increased presence of funds in emerging markets could be overemphasized. For example, the investments of funds—primarily those domiciled in the United States and Europe—in emerging-economy stock markets grew from $667 billion in 2009 to $911 billion in 2012, a 37 percent increase (see Figure 1). The share of emerging economy stocks held by funds domiciled in developed countries also rose from 6.7 percent in 2009 to 8.1 percent in 2012. Nevertheless, more than 90 percent of the value of the stock market capitalization in emerging markets is held by other investors, demonstrating that the overall share of developed country funds’ investments in EM stock markets remains small. This is consistent with our recent post on the relative size of fund investment globally. 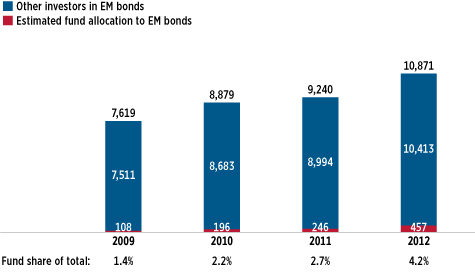 The same trends are apparent in EM bond markets. Figure 2 shows that the estimated holdings of EM debt by funds in developed countries rose from $108 billion in 2009 to $457 billion in 2012, a 323 percent increase. Similarly, the estimated share of funds’ investments in EM debt markets rose from 1.4 percent in 2009 to 4.2 percent in 2012. Despite this, other market participants—often banks or other institutional investors located within EM countries, as well as residents of those countries—remain the overwhelmingly dominant investors in EM fixed-income markets, holding more than 95 percent of outstanding EM debt. The relatively small share held by funds is consistent with a recent IMF working paper showing that EM government debt is held by a diverse base of investors. All market participants, foreign and domestic, can influence asset prices in emerging economies. That said, given that U.S. and European domiciled funds continue to hold only small portions of the outstanding stocks and bonds in emerging economies, placing special emphasis on the influence of these funds on emerging economy asset prices seems unwarranted. As noted earlier, authorities also have suggested that these funds may be a relatively unstable source of foreign capital (as opposed to all capital, whether provided by foreign or domestic investors). Indeed, the IMF’s Global Financial Stability Report argues that “global mutual funds react more strongly to global financial shocks than do [other] large global institutional investors.” We will provide some analysis of this issue in a future Viewpoints piece. Data on the size of stock and bond markets in emerging countries are taken from the IMF’s Global Financial Stability Report, which has not yet published figures for 2013. Consequently, figures 1 and 2 end in 2012. Some of the estimated increase of fund investment in emerging market debt is likely due to better fund coverage by EPFR Global’s fund database over time.